The almost unanimous opposition to charter school expansion on Chicago's Northwest Side was clearly in evidence at the CPS hearing on January 7, 2014 on the Intrinsic and Noble Street charter schools proposals. Intrinsic proposes a 7th-12th grade school at 4540 W. Belmont. Noble's proposed high school would be located at 5357 W. Grand Ave. Despite attempts by CPS and some charter school officials to manipulate "community input" via the creation of the so-called "Neighborhood Action Councils" (NAC), community opposition has swamped any attempt by charter school supporters when truly public hearings were held. 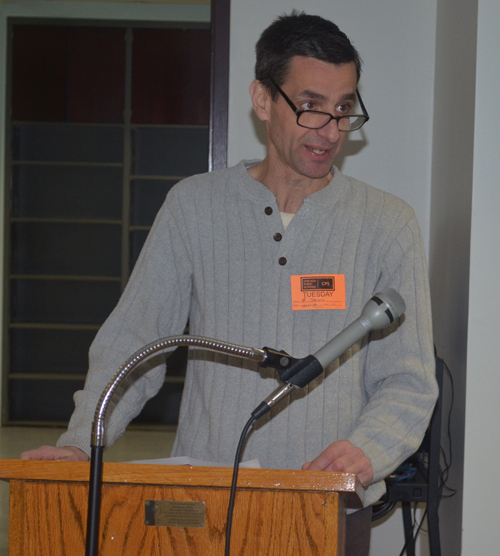 Alderman Nick Sposato (36) reported on the "strong, vocal opposition in the community" to the charter proposals. "Parents are not looking 'for choice,'" he said. "They want improvements in their schools. "In an area where overcrowding of the city's real public elementary schools is a problem, parents, teachers, students and political leaders are demanding that CPS stop a policy of sabotaging the city's real public schools, invest in the city's real public schools, and completely reject the claims that charter schools are the solution. While nearly 200 people came out for both a community town hall meeting at Riis Park in October, and the NAC meeting in December, the meeting at CPS on Tuesday, January 7, drew only a dozen participants on what was reported to be the coldest day in 20 years. 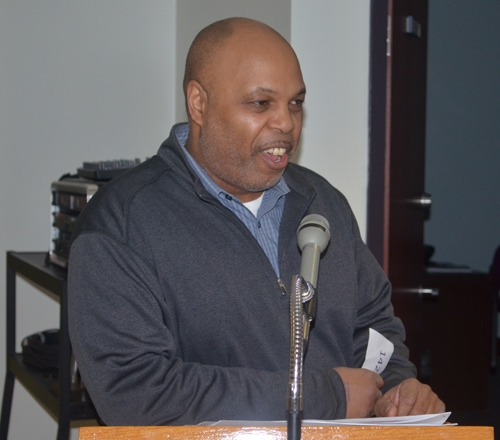 The January 7 event was held downtown at CPS headquarters at 125 S. Clark St. The cost of Loop parking alone kept many local residents away, with many community activists opining that was the purpose of hosting the hearings at the school system's central headquarters. The hearing began at 4:30. Hearing officer Cory Oshita presided. He said he was not there to make a recommendation, but would hear from everyone who signed up to speak and would include their comments in his report. Austin community leader Dwayne Truss said the while people know they need to take part in the process of hearings, they know it is a farce.Noble's Tom Molder, the designated principal of the proposed school, said the school would focus on strengthening students' critical thinking through "Hartness Method" discussion groups. He said there is a need for "high quality schools" on the North West Side. Dwayne Truss, an Austin community activist, said there is no need for new charter high schools, especially with the "extreme discipline and demerit" methods of Noble. Truss said that the area already had high-quality schools, but that the schools "need resources and students to be nurtured." Melissa Zaikos, the founder and CEO of Intrinsic, stressed the "technological game changer" that Intrinsic would offer students through the use of "personalized instruction" through Chrome books and the use of a computer program called Think Circa. Zaikos, a former "Chief Area Officer" at CPS, did not reveal the insider ties she had prior to her becoming an "edupreneur." Steinmetz teacher (and this reporter) Sharon Schmidt said neighborhood high schools Kelvyn Park, Foreman, Schurz, North Grand, and Steinmetz, and the career academy Prosser High School are not overcrowded. New charter high schools in the area would result in lower enrollment and further cuts for the existing schools. "Let�s not forget what exciting vibrant places our real, existing schools," Schmidt said. "We have successful alumni who treasured their days at Steinmetz, special programs, outstanding, college prep academics, the Gay Straight Alliance and many other clubs, and all the sports serving our students � thanks to long-term staff that creates and nurtures these programs. Steinmetz has successfully served the students of the Belmont Cragin neighborhood for 79 years." Chicago Teachers Union researcher Sarah Hainds spoke about the lack of transparency of Noble and other charter operators. Chicago Teachers Union researcher Sarah Hainds decried what Mayor Rahm Emmanual calls the "secret sauce" of charters: "Charters are supposed to experiment with innovations and share with public schools," but charters are not transparent with their methods, data, and finances, Hainds said. Hainds said the charter operators who presented their plans used a lot of "buzz words" to promote their methods, but "nothing is evaluated." 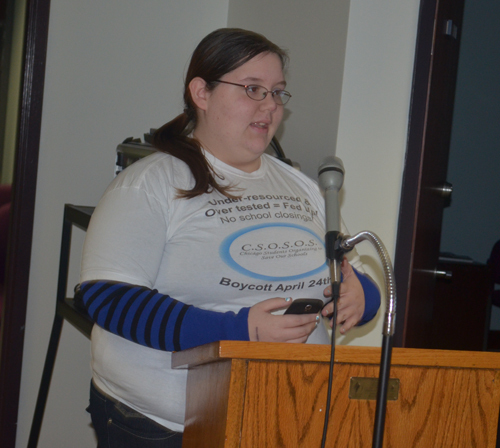 Many charters have not completed audits, and most of those who did do not have good reports. In addition, Hainds said, the charter "spending is out of control," she said, and the demand from parents "is not there." Alderman Nick Sposato (36) said he is "concerned with the expansion of charters, not just on the North West Side, but all over the city." He said he is "alarmed" that CPS would close 49 public schools and invite 21 private companies to run new schools. He said at all the community meetings he has attended he has heard "strong, vocal opposition." Sposato also mentioned the impropriety of the North West Side NAC, which was run by Juan Jose Gonzalez, the director of the charter school advocacy group, Stand for Children. Stand for Children recently got indirectly into the news when one of the founding funders of the Illinois Stand for Children, billionaire Bruce Rauner, got caught up in contradictions about his position on the Illinois minimum wage. Although Stand for Children poses as a "grass roots" organization, its initial funding in 2010 came from a dozen millionaires and billionaires, enabling it to purchase almost instant credibility in some quarters, including before the Illinois General Assembly's "School Reform Committee." Donations of between $50,000 and a half million dollars launched Illinois Stand for Children in the final months of 2010 and enabled the group to make major donations to several political candidates. Sposato said that CPS' push for charter schools was not answering parents' concerns. "Parents are not looking for choice," he said. "They want improvements in their schools." Steinmetz junior Dalia Mena, working with Chicago Students Organizing to Save Our Schools, spoke at the CPS hearing on Jan. 7: "What we need to do is invest in the success of our neighborhood schools, not build more charters. "Uplift High School teacher Karen Zaccor said she felt "compelled to say what a travesty this process is." 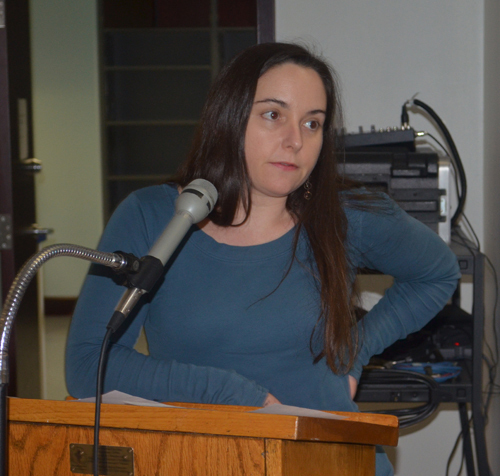 She noted that the weather should have caused CPS to reschedule the hearing, that the hearings had been split into three rooms, and that the request for charter proposals came on the heels of the school closings and drastic budget cuts. "Please invest in our really good, existing schools," Zaccor said. "Invest the same amount of energy or fraction of energy in our existing schools as you are investing in the charters." 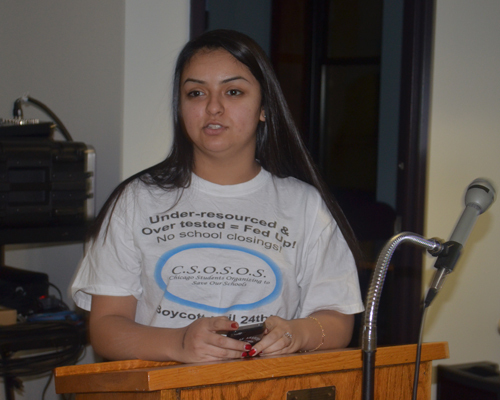 Steinmetz High School junior Dalia Mena echoed Zaccor. She said, "I am here today because every time a new charter opens, neighborhood schools lose students and money. This is an injustice. What we need to do is invest in the success of our neighborhood schools, not build more charters." 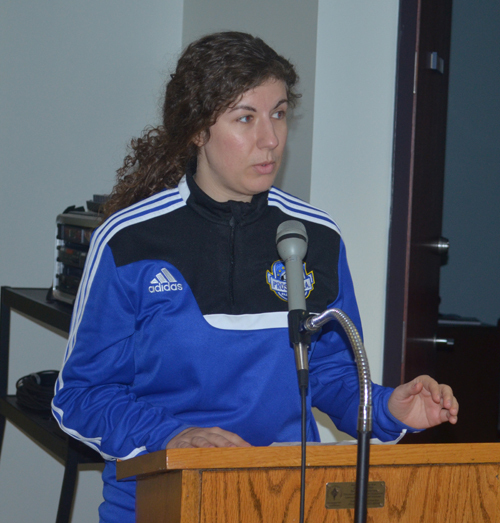 Dalia also reported on the Communities United for Quality Education (CUQE) study. Roosevelt sophomore Jamie Adams, and Chicago Students Organizing to Save Our Schools founding member, said, "CPS needs to see what's going on in our neighborhood schools, what needs to happen. We are asking the Board not to vote for the proposals. ""CUQE released a cost analysis report which estimated that if the 21 new charters are approved they will cost taxpayers over $21 million in new costs during the first year," she said. "Costs will total over $250 million over the next 10 years. This is unfair to spend our tax money when its something that not all parents and students want. "CPS needs to hold off on the voting on a record number of new charters so they can fully understand what this will cost all of us!" CTU organizer Martin Ritter, who also serves on the Whitney Young High School Local School Council, spoke of the lack of proof for charter school success. "Intrinsic has been operating for a few months," he said. "There is not one full year of data. There is no proof. So let's just give them another school. It's too ambiguous, but we live in Chicago, where we bust unions and close schools. Common sense says don't approve the charters. Invest in the schools we have so all students will have the schools they deserve." Uplift High School LSC member Mark Kaplan said that he has been part of the "struggle to make our schools strong." He spoke about the success of Uplift, a college prep and social justice school. He said many of the graduates have been successful in college. But now, Kaplan said, Uplift has been "cut to the bone." "It's preposterous and absurd, to cut budgets, and close schools, yet here you have money for charters," Kaplan said. "It makes no sense. Put money into strong schools that already exist." We at Prosser are very concerned about safety issues. Putting two high schools across the street from each other is asking for trouble. It is poor city planning and no one I have spoken to thinks it�s a good idea or that it makes any sense. Would you put a police department across from a police department. A hospital across from another hospital? This is already a congested area with thousands of students around the Hanson Park area. I�ve attended many community meetings and the overwhelming consensus is that this proposed Noble charter school is a bad idea and not wanted. Many of the programs Noble touts already happen at the public schools in this area. Noble�s track record for college graduation isn�t any better than the schools that already exist in that area. Lastly, it�s completely demoralizing to close schools and cut budgets across the city � specifically $1.2 million from Prosser and that fully find the daily operating costs of a charter schools across the street. That�s not giving parents choice. The public high schools in the community like Prosser, Steinmetz, and Kelvyn Park should get that money. These schools are not overcrowded and need to be heard instead of ignored by the board because they are distracted by shiny new charter schools. The sign up for the Jan. 22 meeting is Monday, Jan. 13 at 8:00 a.m.. See the following for information: http://www.cpsboe.org/meetings. As you can see from this report, every single speaker (except the charter school presenters) articulately opposed the plan. Let's hope that the Jan. 22 meeting � when the Board votes on these and the other charter proposals � will include the same during pubic participation. I took a personal day to attend the board meeting in Dec. Any teacher can do the same, and share about the high quality education they are providing in their existing, public school. Thanks Sharon for a great report. It inspires us all to fight for what's right!